Each year, as the tech world converges on Las Vegas for the giant Consumer Electronics Show, a few common themes emerge. This year, expect those themes to center on fast laptops and desktops powered by Intel's new Sandy Bridge line of processors, lots and lots of Android-based tablets poised to take on the iPad and the expansion of 3D technology into more (and, in some cases, cheaper) TVs and cameras. The news in systems is all about Intel's Sandy Bridge chips, a new architecture that's designed to significantly improve video display and game play and speed video encoding on systems without discrete graphics cards. The first tests of systems with Sandy Bridge processors should be published soon, but Intel's demonstrations of laptops armed with the chips were impressive. Video encoding tasks took a fraction of the time required by previous generation chips, despite putting a much smaller load on the system's CPU. 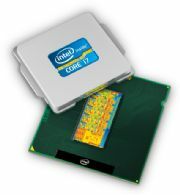 Intel says Sandy Bridge chips are also more power efficient and easier to overclock. And unlike most chip launches, which are aimed at high-end machines that only early adopters with deep pockets will buy, the first Sandy Bridge chips are in the midrange, so average consumers will be able to experience them immediately. In laptops, you shouldn't expect major changes in the look of the new machines. Most manufacturers will likely put the new chips in familiar-looking systems. In desktops, expect to see more all-in-one systems that will be even more capable with Intel's new processors. You can expect to hear about lots of new tablets at CES, many of them running some version of Android. The question is whether any of them will be a worthy competitor to Apple's iPad (or, harder still, the iPad 2 Apple is rumored to be announcing soon). The only significant competitor to the iPad so far is the Samsung Galaxy Tab. Verizon recently dropped the price of the Tab by $100 (plus $60 worth of free movie rentals), a possible indication that sales of the Tab have been disappointing. One problem with early Android tablets is that they're running versions of Android that are designed for phones, not for tablets, as Google acknowledges. Any Android tablets announced for immediate availability at CES will suffer from the same handicap. That's why much of the buzz is over a tablet that Motorola sort of announced in a YouTube video. That the end of the video features a bee indicates that this tablet will run Android 2.4 ("Honeycomb"). That's the first version of the OS that will be optimized for tablets, but it likely won't emerge until March at the earliest. But Android isn't the only potential tablet OS around. RIM may have more news of its already announced Blackberry Playbook. And there are rumors of a WebOS-powered tablet from HP. Finally, some manufacturers will probably try to make a go of a tablet powered by Windows 7. 3D HDTVs were one of the main themes of last year's CES. But over the past 12 months, the buying public has been largely unimpressed. There are lots of reasons for the lack of excitement: there's very little 3D content, the 3D effect on many TVs can be more sickening than exhilarating and 3D TVs require expensive, heavy, active shutter glasses. The technology for glasses-free 3D is still too expensive for average humans to afford, so TV manufacturers will likely introduce more models that can be used with the kind of polarized glasses used in movie theaters. Those TVs may be more expensive initially, but the glasses will be much cheaper. Also expect announcements about improvements in the technology of LCD TVs. Some LCD screens, especially super-thin TVs in which the LED backlights are all along the edges of the screen, have a hard time with scenes where there is a dark object moving across a bright background (or vice versa). The problem is how to precisely darken some areas of the screen, while keeping other areas light, especially when the backlights aren't directly behind the screen but along the edge. All LCD manufacturers are aware of the issue, known as local dimming, and many will likely be announcing sets with new ways of solving the problem. This video by our HDTV guru Patrick Miller explains these trends and more to look for at CES.